When an e-mail from Vilnius came with an invitation to join the traditional annual run "On the Road of Life and Death", we were listening to Brahms' piano concerto in Portland performed by a student of the prestigious Rice University in Houston (Texas), Lithuanian pianist Rūta Kuzmickaitė who was born five years after the historic events of 13 January 1991. She had returned for holidays to her family in Oregon. Amidst this enchanting music, an original idea was born - perhaps US Lithuanians could join, if only symbolically, this traditional run in the homeland that over 4,000 participants took part in this year? Faith, sacrifice and freedom - these words are of growing importance to our nation as we commemorate the Day of Freedom Defenders, irrespectively of where we live. 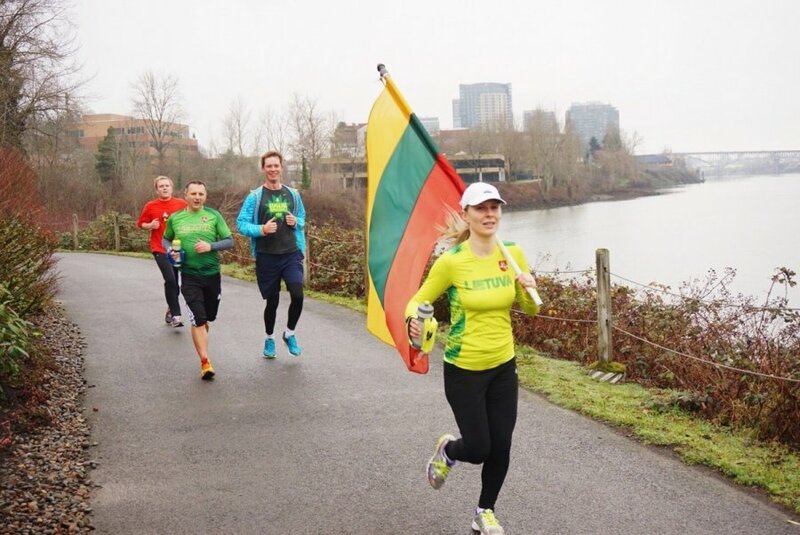 Unlike the participants at the Antakalnis Cemetery, the US Lithuanians were not greeted by Lithuanian or local government officials at the start line in Portland. However, three people stood out from the crowd of Lithuanians who gathered at Willamette Park of the Rose City: Russians Andrey, who grew up in the Siberian part of Kazakhstan, Misha and Sasha, who were also born in distant Siberia. "You, the Lithuanians, did not lose your unity even when you lived with us, in the Land of Eternal Frost," said Mikhail from Irkutsk who married Lithuanian Rūta from Rokiškis in the US in 2007. He proudly accepted a Lithuanian tricolor from the author of these lines in order to pass it over, nine kilometres hence, to Inga, the leader of the group of runners whose husband Andrey comes from Semipalatinsk (now Semey). The offspring of both "Soviet" families - Tomas, Maksimus and Dominique - attend the Lithuanian "Atžalynas" school founded last year, while Andrey and Misha earnestly work on the parents' committee. In the liberal Portland, Russians support the local Lithuanian community, admiring its patriotism and efforts to stay one big family even in emigration. The run in the Rose City, just like the one in the Lithuanian capital, was cheered on by many people who came to look at the runners in the early hours of Sunday. Even though Vilnius TV Tower does not stand in Oregon's biggest city and Russian tanks never rode along its streets, freedom-loving people of Portland cheered flag-bearing Lithuanian runners who paid tribute to one of the key events in their nation's recent history. We have discovered that the "On the Road of Life and Death" run is spreading to other European cities, too. The previous weekend, Lithuanians of Belgium and their friends from various EU countries took part in the run, attended by some 50 people, for the second time. Lithuanians from around Portland joined the tradition this year and our hope is that people from other major US cities will join us next year. Moreover, the Lithuanian community of Portland is soon to welcome an honourable guest from Washington, D.C. On the occasion of the 13 January, Lithuanian Ambassador Žygimantas Pavilionis is giving lectures at Portland State University and the World Affairs Council in Oregon. The US Lithuanians are also preparing for the Hood to Coast Relay. The Lituanica team is taking part in the annual event for the third time this year.